GamesFirst! || Sony Gets It: Rumble Is A-Go! home > news > press release > Sony Gets It: Rumble Is A-Go! A press release from Sony just announced the DUALSHOCK 3 Wireless Controller. Featuring (dun da da dun!) RUMBLE! Yep, that\'s right. The Dualshock is back. According to the press release (which is below, if you feel like reading it), the controller still maintains \"the high-precision, high response motion sensitive six-axis sensing system.\" I\'m not one of those people who thinks the SIXAXIS was a bad idea, but asked to describe the feature and \"high-precision\" is not one of the adjectives I\'d use. There\'s a lot of PR hyperbole in there, like a bell pepper stuffed with rice, but that\'s the nature of these things. 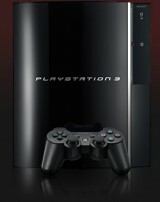 This is very good news for PlayStation 3 owners. Also in the press release -- which is what you really need to see -- is a list of games that the new Dualshock 3 will work with. Currently sold games will get some rumble love through online updates, while new games (including Metal Gear Solid 4: Guns of Patriots) will be enhanced by the rumble feature. TOKYO, Sept. 19 -- Sony Computer Entertainment Inc. (SCEI) today announced that it would release DUALSHOCK(R)3 Wireless Controller, a new controller for PLAYSTATION(R)3 (PS3(R)) incorporating a rumble feature, in Japan in November as a separately sold accessory. It inherits the basic design and functionality of the popular PlayStation(R) controller, while keeping the high-precision, high response motion sensitive six-axis sensing system. Introduction to North American and European markets is expected in spring 2008.